This flavor-packed dish is healthy, keto and low-carb and makes a delicious protein packed meal that can be cooked in under 15 minutes. 1. Wash and trim the ends of the zucchini. Make the zucchini noodles using a spiralizer and set aside. 2. Heat 1 tablespoon oil in a large pan over medium-high heat. Add the shrimp to the hot pan, season with salt and pepper cook for 1 minute. Add the garlic, Italian seasoning, and crushed pepper to the pan. Cook for another minute per side or until shrimp is light pink and garlic is golden brown. Transfer to a bowl. 3. 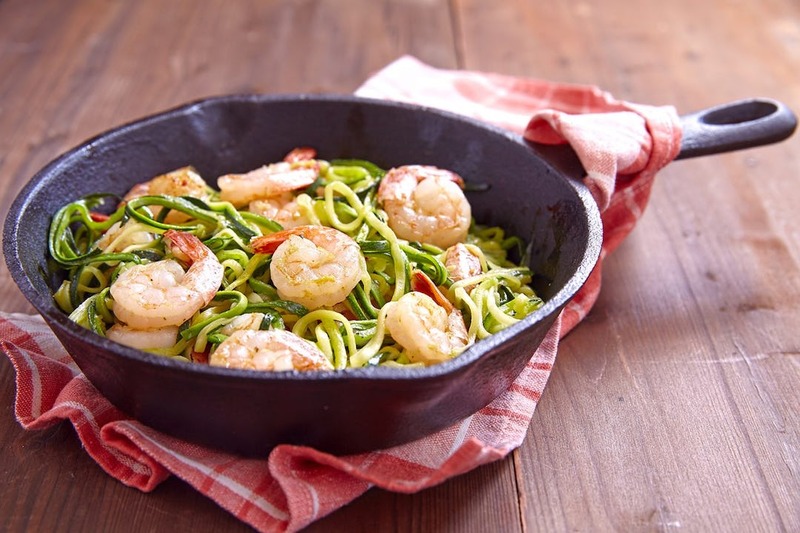 Add the Butter and zucchini noodles to the same pan, season with salt and pepper and cook for 2 minutes or until tender. 4. Return the cooked shrimp to the pan and stir through. Garnished with freshly grated parmesan cheese or/and chopped parsley. For more recipes or if you want to follow Raleigh’s transformation story you can do so on instagram @raleigh_koel_moore.